Is your content ailing and in desperate need of medical attention? Is it vibrant, powerful and compelling or is it dull, weak, and boring? Does it have acute or chronic symptoms of illness? Can you save the patient or is it time to pull the plug and give your work a proper burial? Perhaps you need some direction from “Bones”. No, I’m not referring to the lovely and talented Emily Deschanel. I mean the real McCoy. Dr. Leonard “Bones” McCoy of Star Trek was the greatest fictional medical doctor of all time, crushing today’s champ Dr. Gregory House with better technology, skills, and bedside manner. McCoy had a heart of gold beneath his irritable exterior. By contrast, nobody’s found House’s heart yet, and he seems to have selective amnesia when it comes to the Hippocratic Oath. You might not need the real McCoy on staff, though. You can follow his example. There’s a doctor in your house, right now, that can help cure many problems with your content, with the help of some knowledge and skills. And that’s you… equipped with the knowledge in this post. “I’m a doctor, not a bricklayer!” was a classic McCoy line. In The Devil In The Dark, he needed to heal a wounded rock creature (the Horta), but he had no experience with that kind of alien physiology. He was terrified of harming the Horta through his lack of knowledge or experience. You need a certain amount of knowledge and experience with your subject matter to write compelling and useful copy. If you’re going to write about the mortgage industry, you’d better understand terms, rates, renewals, asset values, insurance and many other important items that pertain to this industry. Otherwise, you’re going to harm your reader by giving them poor information, and ultimately you’re going to harm yourself. Fortunately for the Horta, McCoy was able to work out a means to treat the Horta through the use of 23rd century concrete to patch the creature’s wound, much like you might fix chipped or cracked sidewalk. He came up with a workable solution by drawing a reasonable conclusion about the physiology of a rock being. If you can find parallels between your normal subject matter and similar, but different topics, you can bridge the gap of understanding and create good work. If you’re a golf writer, maybe you can branch into archery or billiards, which are sports that focus on individual competitors. Dr. McCoy and Mr. Spock were, on the surface, polar opposites. McCoy was a creature of feeling and compassion while Mr. Spock seemed to rely solely on logic and reason in handling any situation. When you look at their relationship with Captain Kirk, you can see that his two closest counselors offered him a balance of opinions when dealing with any crisis. Clearly, logic and reason are extremely important, but when you’re dealing with human beings you’ve got to understand, if not embrace, feelings and irrationality. It’s true that writing has to have an underlying logic and flow behind it so that the reader can understand it without bursting some brain cells. Structure, facts, grammar, spelling, and punctuation play important roles in creating good content. However, great content resonates with emotions, challenges the reader, and can lead to a powerful call to action. Content without feeling is as good as dead. There has to be some kind of logic directing the call to action in your copy, but it also needs to have some underlying emotion. Unless it can provoke an emotional response, the reader just won’t care. 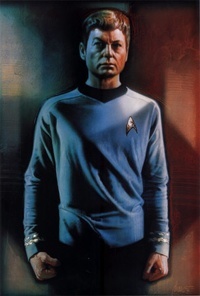 Dr. McCoy had a strong streak of decency and respect for all life. He lived the oath “do no harm” consistently in his role as chief medical officer of the U.S.S. Enterprise. He wasn’t afraid to take his captain to task, in public or in private, whenever other beings were at risk of pain or death. In Star Trek VI (The Undiscovered Country) McCoy makes a valiant attempt to save the life of the wounded Klingon Chancellor Gorkon even though the Klingons and the Federation were barely restrained enemies. Similarly, you must do the right thing for your audience. Tell the truth, give them the facts, and “omit unnecessary words” – even when it makes your job more difficult. Challenge the reader to understand your message and to take action, but don’t make their job too hard by hiding important thoughts, steps, or information. Technology has its proper place and time. On one hand, McCoy always jumped at the chance to use new medical techniques and technology. On the other hand, he hated transporters and their unnatural “scrambling of molecules”. But he had to tolerate them in order to do his job. As a content creator, it’s becoming increasingly important to stay abreast of digital technologies. You don’t need to know them all, though, and you need to realize that poorly applied technology can make existing problems much worse. On the other hand, if we were still using quill pens and parchment, humanity would not have “transported” itself toward the technologies that make our lives easier. What do you do when you’re sick? You go see a doctor. They have the knowledge and skills to fix most ailments. Failing that, you educate yourself to take care of basic problems and reserve your money for those times when you need a specialist. What do you do when your content is sick? You could try to take some direction from the example of Doctor McCoy and see if your own skills can do the trick. In more dire cases, you might need to hire a top-tier copywriter – just like in medicine, sometimes it takes a surgeon’s skill to get rid of the illness. Sometimes a great idea falls flat upon execution and it just won’t work. Maybe you just can’t write compelling copy about rare elephant steaks, diesel dish detergent, or abrasive paper towel. Perhaps you’ve taken the wrong tack and your message is lost in a mess of leaking adjectives, inflamed adverbs, and a chronic clarity deficiency. In some situations, it’s time for the captain to order up a new “red shirt” (aka an expendable crew member or generic blog post) to replace a killed crew member. For you, the aspiring copywriter, this means that it may be necessary to start over again if nothing else is working. Sometimes you just have to pull the sheet over the patient’s face and try to find a way to save the next sick person. Or content. McCoy worked hard to keep the crew of the U.S.S. Enterprise healthy and productive. Similarly, you as a creator and/or editor need to create the best, healthiest, and most functional content that you possibly can. Don’t be afraid to examine your content, check its pulse and temperature, and provide treatment when it ails. Call in the experts if you’re in a jam. Start over if you must. Your readers will thank you for it. And somewhere in the distant future, an old country doctor with a knowing smile just might tip his Mint Julep in your direction, acknowledging that you’d make a pretty darn good content doctor. Mark Dykeman is the founder and main brain of Thoughtwrestling, a blog devoted to developing ideas and bringing them to life. He is the author of the award-winning blog Broadcasting Brain. His work has appeared in numerous blogs, including Mashable.com, Dumb Little Man, Pick the Brain, Lateral Action, and Copyblogger. Next article: Is Your Tribe Holding You Down? I was just telling a friend yesterday how watching Star Trek helped me pass chemistry. Since I’d seen The Devil in the Dark episode (with the Horta) I knew that the answer to the chemistry test question about what other element, besides carbon, might be a basis for life had to be silicon. Thanks for the smile. I totally agree about “writing what you know” . . . so many people pick a “niche” for what they view as the marketing potential. You don’t have to totally be an expert, but at least have something to say without regurgitating it from other people. Thanks for an entertaining and thought provoking take on an old fav. Must. Write. Good. Blog. Brilliant! I loved this blog.. and I love all things Star Trek. Really helped cement certain truths. Right on target. Being familiar with your subject gives you opinions credibility. You will often write with more confidence when you are familiar with the subject, and that confidence shows in your work. Thanks for the article. Not only did I get some good information, but I feel like I just saw an episode of Star Trek. Live long and prosper. Unless I’m crazy, I could have sworn I heard the transporter sound in the background when I read this post. Yes, you’re crazy, Shane. It was a communicator. Any time you can use “He’s dead, Jim” in a subhead, you’ll make me happy. I also very much like “chronic clarity deficiency,” I will be using that again. I want to be on the record as saying that Emily Deschanel is freaking hot. I love these themed articles! Winnie the Pooh, General Motors, Star Trek. Everyone: thanks for your kind comments. Yes, it was definitely a communicator you heard! I’m afraid my writing wil not be winning any awards any time soon. But it seems ot get my point across clear enough to my readers. Arguably the best ST character ever is now helping me to write. Fantastic! Excellent post Mark, thank you for writing it. Love the Star Trek analogy. Spock always knew what he was talking about. I wonder if he wrote a blog if it would be interesting or boring. Ah, the great questions of life! I really enjoyed the article. Fantastic idea. You did a great job of bringing up my memories while explaining the context for those who might not have them. The unexpected angle made me think a little extra about a couple of the familiar points. In content development, business, life… words to live by. Copy is so important but even if you are not a copywriter you can create great content if you have a passion for and some knowledge of the subject. Great article; brought a big smile on my face and made me link it to my McCoy fans mailinglistsphere 🙂 Thank you! Most likely, the ‘patient’ isn’t actually dead, but only needs to be put into the drawer until the author / doctor becomes more skilled. I certainly love the way you described his way of working and I think you really got McCoys personality right, but I can’t agree with one thing you wrote in your introduction: You wrote that he’s much better than House, because he has an heart in contrast to him, but House even risks his life for his patients and with his primitive technology he rescued more people.